Ico is not a good game in most senses of the word. I mean sure it builds up an atmosphere of mystery and I do feel like a helpless youth involved in events bigger than myself. However the game has some of the most sluggish controls and puzzles that require more dexterity than you are capable of given your character’s abilities. Shadow of the Colossus was clearly the superior game and… oh wait, I was supposed to be talking about Fossil Echo. Sorry, about that: I tend to keep getting those two games confused. Fossil Echo is a game that wants so much to be Ico,picking up its design warts and all, that I’m surprised a pale girl doesn’t show up as a companion. 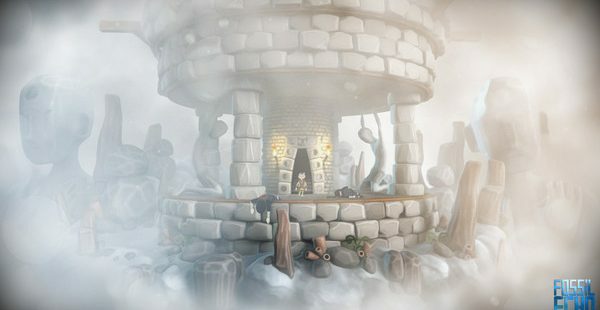 The game is a puzzle platformer following a young boy as he climbs a dilapidated tower. Along the way he must evade shadowy figures and perform the acrobatics needed to reach the top. 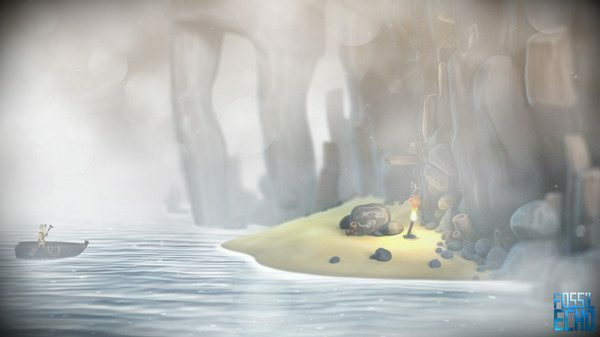 Fossil Echo does well to tell a story through actions and music with a lack of spoken dialogue. I’ll admit I’m a sucker for this style of storytelling since it lends itself to interpretation and a more expressive story. As the game progressed I was drawn into the haunting tower that composes the game’s central locale. It crumbles around you, often giving a clear view to the skyline. Banners for a mysterious group that our hero pursues litters what walls still stand. It gives the feeling that this an organization that may be desperate or even dwindling in numbers The beautiful music mixed with ambient noises calmed me despite the terrible gameplay and dull narrative. As mentioned there is no real dialogue and the story is told through actions and expressions, and concerns a young man in Native American garb climbing a tower filled with guards. We’re given the narrative piecemeal through short flashbacks and the boy’s reactions to minor game play events, such as when the player must chase some loose feathers from the boy’s headdress up a windy section of the tower. This shows us that for whatever reason those feathers are important to our hero. At time of writing I’ve been through a decent chunk of the game and have no interest in finding out the greater purpose of my journey. If the game play was even marginally okay then I’d be more willing to see it through. But it isn’t, so I’m not. The controls seem to be going through a messy divorce with the level design so any slip up leads to many a frustrating situation such as the tower climbing section I mentioned before. There are multiple instances of this style of level and each is a shining example of this game’s shortcomings. They auto scroll at a very quick clip to where one slip up equals death. Compounded with the very skilled platforming required, some just as you’re done learning the basics, it’s really hard to justify continuing this game. I didn’t stop though, I may be a masochist…perhaps? After the first metaphorical brick wall, I found another one immediately. As the controls fought to prevent me from avoiding guards. Guards perform their rounds a tad too fast, all have itchy trigger fingers, and are crack shots leaving little room for error, of which there will be plenty. Every room devolves into a frustrating chore since it’s hard to play around your weaknesses. The levels seem to demand a precision that you don’t have, and the sense of helplessness becomes frustrating to the point that it isn’t enjoyable to even try anymore. Shadow of the Colossus could evoke the same feelings, but at the same time left a wider margin for error. Dropping the beasts, likewise, was immensely satisfying…even though I developed a guilt complex right afterwards. Fossil Echo ends up copying Ico‘s style and gameplay without taking the time to think about whether that’s a good idea or not. 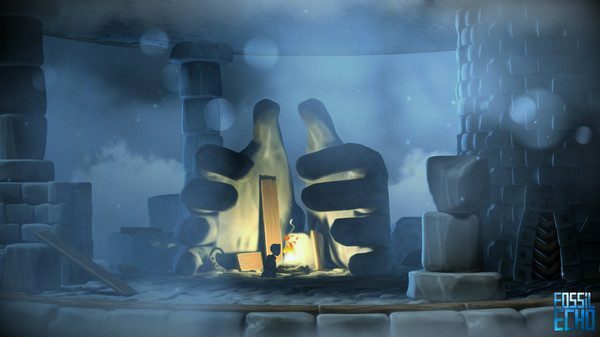 Fossil Echo follows the path that Ico trod all those years ago and those who enjoyed that journey will gladly stumble down it again despite the numerous bumps in the road. Those who found Ico fun are the same types who will enjoy Fossil Echo. However if you’re like me and prefer your masochism to stay in the bedroom, then pass this up. It does build an atmosphere well enough. but the gameplay can’t be saved by that alone. Look to They Bleed Pixels for a game that takes a haunting atmosphere and has controls that are better tailored to its level design.